Do you have Tonka Toys to sell? I am looking for Excellent Tonka Trucks and Sets of Tonkas. Paying top dollar for Private Label Tonka Toys in Excellent condition! Please Contact me: Micah@tonkatoys.com or Call me at XXPHONE_NUMBERXX. .
Use the buttons Below to jump to your Favorites Welcome to my Website celebrating the history of Vintage Tonka Toy Trucks from their early Beginnings in 1947 up to 1970 or so, these fantastic toys are an important part of American Toy culture and Represent an Important part of our childhood from those earlier years. These Tonka Toys were built to last and trucks like the one shown below are over 50 years old and in incredible condition! They really were built to last lifetime! Here is one tough Tonka Set! 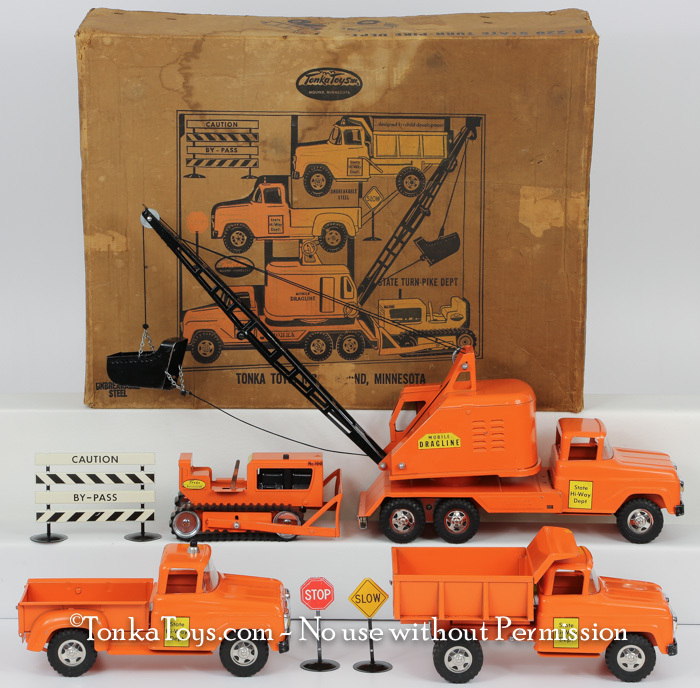 This terrific 1960 set includes the Hi-Way Pickup, Hi-way Dump Truck, Mobile Dragline and number 100 Bulldozer. The set also includes 3 signs, the Stop, Slow and Road Closed signs. This is an all original truck set in terrific conditon that has been cleaned and polished. I am always looking for Vintage Tonka Toy trucks in Terrific Condition like the ones shown in this website, Individual toys, Boxed sets or entire collections. Here is an Iconic "Round Fendered" Vintage Tonka Toy Pickup Truck from 1957, while this dark blue is one of my favorite colors, it is hard to find in terrific shape like this. The blue metallic paint on these truck has a tendency to "craze" or spider web the paint. The bronze metallic paint had the same trouble form the same timeframe. You can tell this truck is a 1957 by the yellowed push in headlights and the round fender, that makes it a 1956 or 1957 only. And the 1957 Vintage Tonka Toys Pickup Truck has a hood scoop while the 1956 Vintage Tonka Toys Pickup Truck does not.
. All Rights Reserved. The design and images other than the Tonka Toys Logo are the property of Micah James. If you would like to use any of the photos of graphics on my site, please email me.